Reinbek bei Hamburg: Rowohlt Taschenbuch Verlag, 1986. This is a paperback compilation, in German, including The Blessing Way. Published in 1986 by Rowohlt Taschenbuch Verlag under their "thriller rororo" series, this compilation also contains works by Detlef Wolff and Edgar Box (Gore Vidal). Series editor is Bernd Jost. 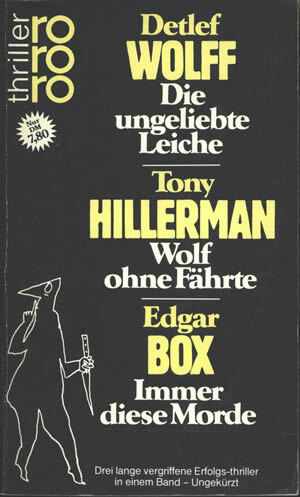 The German translation of Hillerman's novel is by Gisela Stege. This is a paperback book with a black cover, and yellow and white text. Binding: Two-color paper covers. On the spine, the authors' last names and "Sammelband" ("anthology") are printed in yellow on black, horizontally, bottom to top.